1. Both parties have realized that bamboo forests have multiple economic and ecological values. There is especially large potential in fixing carbon dioxide, providing forest products, income generation and poverty alleviation, which has been well recognized by the international community. Research and demonstration practices prove that bamboo forests, as multi-functional forests, can secure livelihoods and protect the environment, through functions such as erosion control, soil and water conservation and providing habitats for other plants and animals. 2. As an organization with a mandate for environmental protection and poverty alleviation, INBAR aims to ensure that it is an environment-friendly and low-carbon institution. For this reason, since 2010 INBAR has offset its emissions from business trips and other activities. As a first step on this effort, a fund scheme at INBAR has been built to offset the carbon emission from staff flights. Following the carbon emission standard set by CGCF, INBAR has allocated funds from each flight trip of the staff according to mileage of the trip. INBAR will donate the funds to CGCF for an afforestation programme in Jinggangshan or other suitable location to offset the emission from the flights made. 3. Since the UNFCCC COP 15 in Copenhagen, INBAR has been dedicated to researching and exploring the role of bamboo forest for mitigating and adaptation to climate change through sustainable management of bamboo forests. The two parties will carry out joint efforts on research, demonstration and capacity building to combat climate change through the sustainable development of bamboo forests. 4. Both parties realize that bamboo forests have significant features relevant to carbon sequestration and simultaneously are important for environmental protection and income generation. Critical step should be taken to develop carbon measurement and monitoring methodologies. Hence, the two parties agree to sign this MOU to promote and seek wider and long-term cooperation to jointly develop projects, raise project funding, strengthen international cooperation and build capacity for a long-term partnership. The aim of this partnership is to increase the recognition of international community of the role of bamboo forest for mitigating and adaptation to climate change, to explore the potential of sustainable bamboo forest management in combating climate change, development of the global economy and protection of the environment. The International Network for Bamboo and Rattan (hereafter referred to as INBAR), based in Beijing, is an independent, non-profit, inter-governmental international organization, which contributes to poverty alleviation, environmental protection and fairer trade through promoting sustainable use of bamboo and rattan resources. INBAR’s office address is No. 8 East Futong Street, Wangjing, Chaoyang District, Beijing. 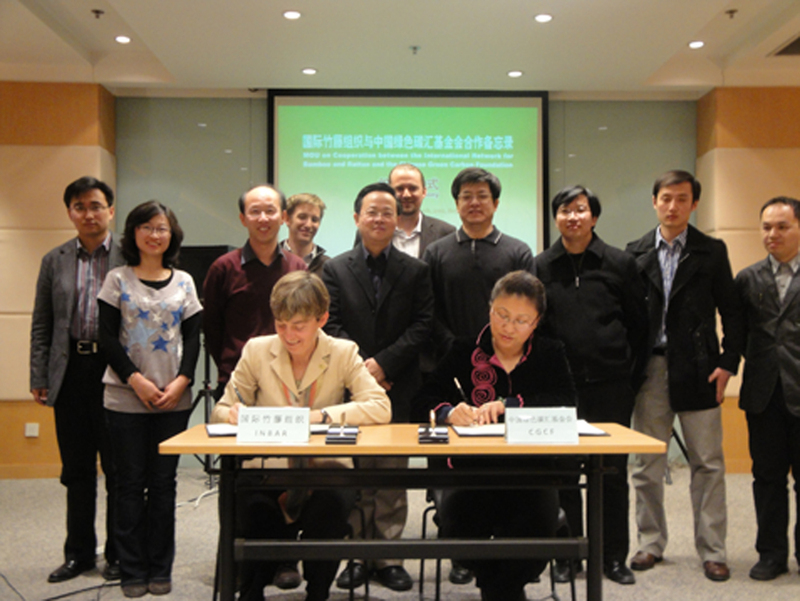 The Chinese Green Carbon Foundation (hereafter named as CGCF) is a national public foundation, and the first organization set up in China to increase carbon sequestration and reducing emission through promoting afforestation, sustainable forest management, reducing deforestation and other relevant activities, as well as knowledge sharing and awareness- raising and capability building on combating climate change, and supporting and improving payment for environmental services (PES) systems in China. The address of the CGCF office is No. 18 Heping East Street, Dongcheng District, Beiijng.